Note: For successful completion of this guide, one of the steps is to publish resources from a Remote Desktop Server. As a result, Terminal Services (for Windows Server 2003) or RDS Services (for Windows Server 2008 and following releases) with available TS/ RDS CALs is required. Note: One should be logged in with an account that has administrative privileges to install Parallels Remote Application Server. Close all the other Windows programs before running the installation. Log in to the machine and download the latest version of the Parallels Remote Application Server from the Downloads page. 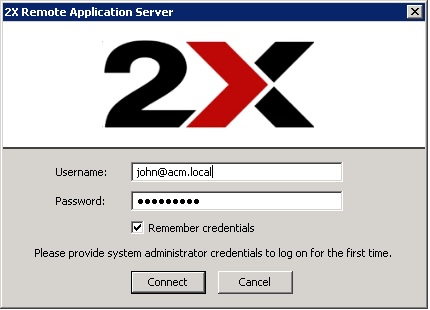 Double click the 2xAppServer.msi to launch the Parallels Remote Application Server installation wizard. Click Next when prompted. Select the option Parallels Remote Application Server for a default installation of the Parallels Remote Application Server and click Next. Click Install to start the installation. The setup will now copy all files and install the Parallels Remote Application Server services. Click Finish, when the installation is completed. The first time the Parallels Remote Application Server Console is launched, one needs to specify a username and password in FQDN format, for example administrator@domain.local, as in the screenshot above. The specified user will be automatically configured as the Parallels Remote Application Server administrator. A system administrator account can be used to log in. This usually means either a Domain Admin account, or a local admin account.